February is the month of love! And while we often focus that energy on our partners, children, and loved ones, we’re encouraging you (all of you rad business owners out there) to take some time to consider what you're doing to extend that love to your current clients and customers. Did you know that it costs at least 5x as much to gain a new customer than it does to retain an existing one? As a small business owner, we are often so focused on gaining new customers, that once we start to build momentum and create a client roster, we don’t have a plan in place to ensure we are treating our repeat customers well. And the fact of the matter is, people buy from brands that they trust, and past customers are more likely to trust you since they’ve already worked with you, so they are that much more likely to buy from you again. If you’re still hesitant about this idea, read this article by Forbes where they uncover how 80% of your future revenue is tied to a core group of 20% of your current customer base. Yeah… take a second to read that again. 80% of your future revenue is tied to 20% of your existing customer base! So often with our social media and digital marketing efforts, we are concerned about our number of followers, or the number of subscribers on our email list. And while that is still important, your engagement rate matters more. Take the time to engage with your best customers. You can do this by genuinely responding to the comments they leave on your social media accounts and even making the effort to engage with the content they are producing. Follow them back on social media, or even find a recent blog post they’ve published on their site and leave a comment. These small acts of kindness go a long way, and when you spend this time engaging with them, it shows that you care about the person behind the brand, and a true relationship will begin to blossom. Turn on Google alerts to be notified when anything new is published about your top clients/customers. Customer retention is built when clients trust you. You can build that trust by walking your talk and following through with everything you say you’re going to do. The best way to build trust is to effectively communicate and manage expectations. If you know you have a certain item on backorder — update your website ASAP. You don’t want people placing an order for an item, and then being told it’s going to take longer than expected. Whenever possible you want to under promise and over deliver, so build that into your production timeline and your client communications. Consistently following through with what you say you’re going to do builds trust, which will eventually lead to customer loyalty. Once you have a loyal customer, they are the ones who will pound the pavement telling others about the great experience they’ve had with you, and it’s that elusive word-of-mouth marketing we are all after. What can you change in your process to build better trust, loyalty and advocacy with your clients? We are hired to deliver a service, and all too often once we complete what was stated in our contract, we send a final email with the final deliverables, and that’s it. But this is a really exciting time for your client. You’ve just delivered the photos they’ve been waiting for, or the brand new logo & website. At this point, they are ecstatic! What can you do to push them over the top with gratitude for you? This can be something as simple as a handwritten note with the final package, or sending the deliverables earlier than the timeline you quoted them. It can also be something really unique that is a great way to set yourself apart from all the others. And don’t forget that just because they were a client of yours, they may not be on your email list. Ensure they are signed up so that they hear of any upcoming new services, products or discounts you may offer. Send them a unique gift that corresponds to the service you provided (monogrammed flash drive for their photos, or 10 Thank You cards with their logo that you tossed in with their business card order). Whether you are a product- or service-based business, whenever possible, gather important information from your clients. An easy way to track this is through dates. For product-based businesses, ask your customer to fill in their birthday whenever they make a purchase so that at the beginning of their birth month, you send them an discounted offer. For service-based businesses, remember when your client first signed with you. Maybe you have a special anniversary discount or offering when they hit the 1-year mark with you. And even if you aren’t in the place to offer a discount, a handwritten note will go a long way. Whether for wholesale clients, retail customers, or your one-on-one client engagements, take the time after each interaction to write notes and keep track of the important details. Did one of your wholesale clients open their second location recently? Send them a note or small congratulatory gift. Do you have a loyal customer who placed a big order last year over the holidays? Prepare for that and send them a loyalty discount in preparation this year. How can you incorporate this idea for your business? What would you like to take note of in your client’s life cycle with you, and how can you backtrack to gather that information? Finally, how are you making it easier for your current and past clients to refer you or shop from you again? If you’re a product-based business, what loyalty discount can you offer? Think of the traditional punch card: Buy 10 items and get the 11th free. If you’re a service-based business, consider what type of referral or affiliate program you can offer to people who have previously used your services. If you’re doing everything mentioned above, then your clients are likely already going to want to shout your praises from the rooftops. But if you can add a sweet little cherry on top by giving them a small financial kickback or complimentary service for referring their friends, then it’s a win-win for both of you. Tell us in the comments below — what are some of your favorite referral programs? After reading this, what ideas do you have for implementing some of these techniques into your business? Maggie owns MaggieGentry , where she provides thought partnership & marketing strategy for creative entrepreneurs. 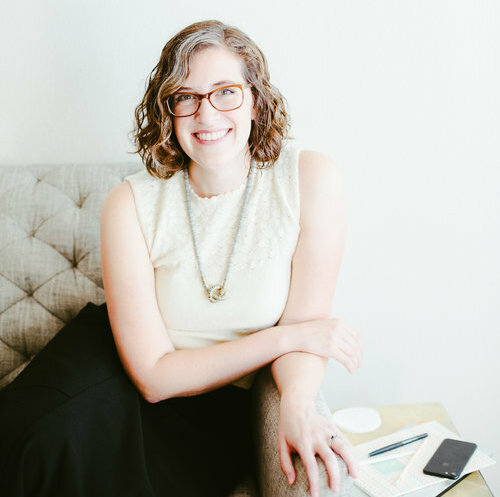 She also hosts the Own Your Why workshops, and is the Creative Marketing Strategist for The Paper + Craft Pantry. You may find her ‘gramming over at @maggiegentry_, and if you’d like to learn more from her, she’s teaching a Marketing Workshop: How to Beat the Social Media Algorithms on February 19 in the studio.